Liduina, Peggy and Jacki met me on the corner of a taxi stand near el centro and we negotiated a price of $200 pesos (about $12) for the four of us to make the 30-minute ride. We arranged pick-up with the driver, as the last time I’d been to San Augustin we finally had to hitchhike the few miles to the highway for lack of being able to catch a taxi from the town. Founded by renowned Oaxacan multimedia artist and philanthropist Francisco Toledo, CASA occupies an impressively formal building that was formerly a spinning and weaving factory founded in 1883 by José Zorrilla Trápaga. Situated to take advantage of abundant water and powered by a small hydroelectric plant, it manufactured raw cotton yarns, blanket, and denim fabrics. A few of the mill machines are still piled up in a small anteroom upstairs. Toledo purchased the property – abandoned in the eighties — in 2000 to create the first eco-arts center in Latin America, a public space committed to education, artistic creation and experimentation. Funded through the National Center for the Arts (CENART), the Oaxacan state government and private foundations, it opened in 2006. Today, CASA supports artistic initiation and creation with spaces equipped for producing digital graphics, traditional graphic and dyeing workshops and textile design, photographic developing and organic printing. Under the premise that multicultural interaction stimulates creativity, CASA invites artists to perform residencies, with priority for ecological and community projects. It’s just icing on the cake that it occupies a location with breathtaking views of the mountains. 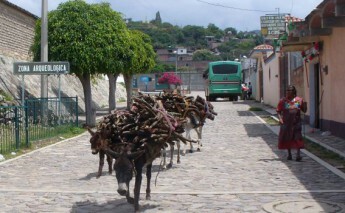 And that the town is a former Zapotec community founded in 1583. Besides the CASA and a tiny artisanal paper-making center, there’s not a whole lot else in San Augustin besides the church and little town square, some beautiful private houses (where chef and cookbook author Susana Trilling lives and conducts her Seasons of My Heart cooking classes on regional Oaxacan cuisine) and a scattering of simple restaurants. A hearty late breakfast of a dark mole tamal, slices of watermelon and mango and freshly-squeezed cucumber/guayaba/orange juice set me back $50, or about $3 U.S. There was even the sound of running water from a tiny waterfall a few meters away (hey, I think metrically now!). Downstairs at the CASA, there was an exhibit of pen-and-ink drawings, prints and lithographs by various artists. Upstairs, while the sound crew set up for the concert, there were breathtaking views of the mountains from the open terraces. It was a perfect day, sunny and breezy. Music was by Viri Roots and the Rootskers, whose Facebook page promised music influenced by el Ragtime, el Dixieland, el Bluegrass, el Pre-War Blues, el Hillbilly, and undoubtedly el Blues. The featured performers were headliner Viri – an exotic eyeful of long tattooed legs under a sparkly skirt, and sporting a headful of rasta curls) — and Daniel and Daniel, who at times played guitar, ukele, moonshine jug and washboard. I recognized “That Good Old Mountain Dew,” though it took me several minutes to remember the words in English, (I’ll pass up my mug if you’ll fill up my jug) and “All of Me,” though the last line there in Spanish was “why not take the rest of me?” The audience chimed in with “Hit the Road, Jack,” and a couple danced to several of the swing numbers – I’d seen them in town promoting a local dance school. Maurilio, our taxi driver, showed back up right at the time we’d requested, a minor miracle in and of itself. Not wanting the afternoon to end, we had a glass of wine back at Jacki’s rustic casita with its 20-foot ceilings and outdoor plant-lined patio. All that jazz in San Augustin Etla. Not a bad way to spend a Sunday afternoon.